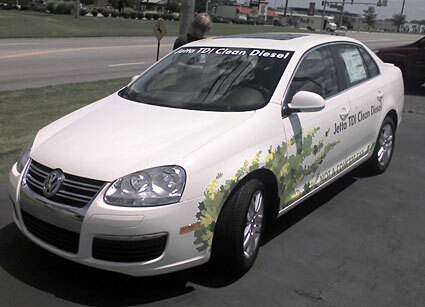 The dealer demo TDIs have been slow to arrive to Cincinnati area dealerships, but today did get a chance to head over to Fairfield VW and test drive the new 2009 Jetta ‘clean diesel.’ Its basically the same body (A5) that has been part of the VW Jetta line up for a couple of years now, but with the new ‘clean diesel’ TDI engine. The first thing I noticed was that you just turn the key to start (I sense that the glow plug/starter delay is handled by the computer in cold weather?). After starting, the new TDI was as quite as any diesel that I’ve ever heard, including the new CDI Mercedes. The engine purred very smoothly, in fact when I opened the hood I could hardly detect the normal TDI diesel vibration familiar to A3 and A4 TDI owners. 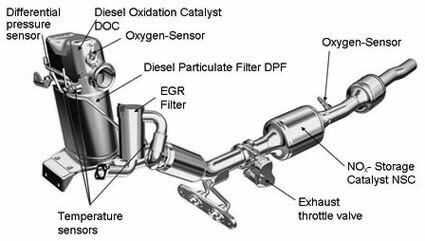 Not to worry though, this slick new TDI still has enough ‘quiet clatter’ to keep a diesel-lover knowing that it is still an oil burner. As for driving comfort, I would have preferred the 6-speed manual gearbox, but then perhaps I’m just old school? I like smaller cars that put the driver in charge and in control of most aspects of driving, especially ones with European handling. Nevertheless, the DSG six speed automatic is by far the best ‘automatic’ transmission to ever go in a VW … or any other car. Its very quick and offers both a sport ‘automatic’ mode and a touch shift clutch-less manual shift mode. I felt that the down-shifting in sport mode would take some getting us too? As for power, a 2.0-liter unit pumps out 140 horsepower and 235 lb-ft of torque makes this car quicker in seat of the pants feel than its gas cousin or perhaps even my old Rocketchipped and Race injectored 2003 VW TDI? I certainly noticed that the handling was far better than most small cars, something Volkswagen owners have come to expect. It felt better than my older A4 and almost as snappy as my son’s GTI. (well that might be an exaggeration) While this added power is most appreciated, it comes on much smoother and yet still offers the fuel efficiency TDI owners love and expect. Don’t be at all surprised to hear 50MPG the norm for highway driving — previous post. All in all, I was impressed. What was a bit disappointing to me, was the fact that its not easy to purchase, since it must be ordered (July 2008). The current supply is non-existent and dealers are asking a premium price. 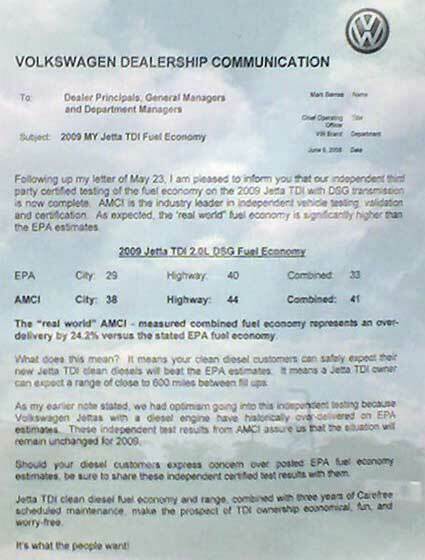 It seems VW dealers realize that there is pent up demand for TDIs after a 2 year hiatus, so they are selling at MSRP with additional markups. 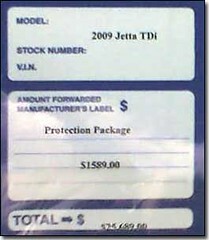 As an example, my local dealership has added a “protection package” which boost the MSRP by about $1589.00. 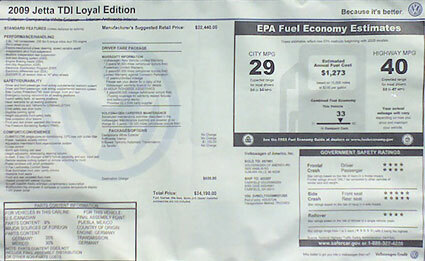 To place an order for a nicely equipped Loyal Edition and DSG transmission with an MSRP just over $24,000 requires $25,689.00 before taxes and documentation. I suppose that the wise buyer will wait for TDI inventories to grow, for the Sportwagen and Tiguan to show up and for competition to start marketing their diesels, but I know it might be difficult to wait yet another year … or so. At any rate, the new TDI is a worthwhile car to at least test drive at your Volkswagen dealer. 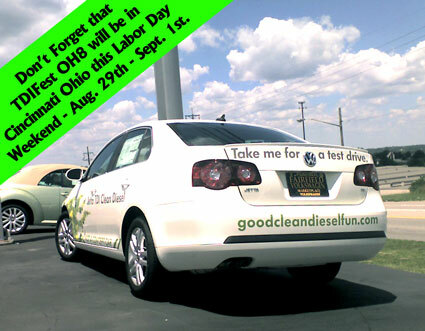 Another option would be to stop in and check it out at the TDIFest OH8 in Mason, Ohio this Labor Day (Cincinnati, Ohio area) — Register at the TDIClub.